It’s the heartbreak of letting someone down, having never been able to fulfill one of their final wishes. It’s the guilt of procrastinating beyond the point of action and living with it. It’s the yearning to make amends and also to commemorate. That’s how Open Orchard Revival began. 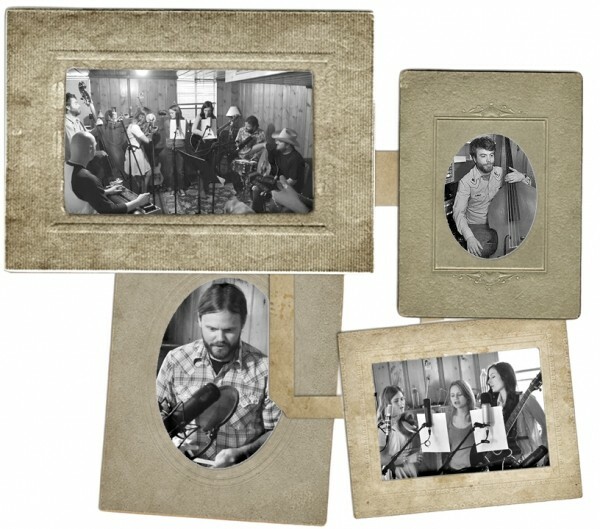 Buehner wanted to give her this gift, regardless, so he asked local musicians—the five members of harmony-laden bluegrass-infused The Folka Dots and three members of Buehner’s twangy alt-country band The Trappers—to collaborate on a gospel album as Open Orchard Revival. “It’s the way I can show expression to people—through music,” he says. “That’s the only thing that I could turn to: to make a record and dedicate it to her.” Open Orchard Revival tapped into the old-timey and traditional sounds they know, love and play on What Are They Doing in Heaven Today? Young was a music lover, but not necessarily a gospel-music lover; she was “David Archuleta’s biggest fan,” Kiki says. No, really. The pop star even appeared on KSL to wish her a happy 97th birthday months before she died. “You’d walk into her house and there was a huge shrine to him, and there I was: a tiny little photo in the corner,” Buehner says with a laugh. Despite that, no Archuleta tune made the cut. Each of the album’s 11 tracks—mainly gospel numbers—were chosen by a band member because the song was near and dear to their heart. For instance, Corinne Gentry (The Folka Dots) chose “People Get Ready” by The Impressions, because it “just carried me through my adolescence—I listened to it a million and nine times.” Kiki Buehner picked “What Are They Doing in Heaven Today?” written by Charles Tindley and recorded by Washington Phillips. “It’s exactly what the record is about: the essence of being comforted by this idea that there’s something else for your loved ones who’ve passed away,” she says. Other album highlights include “I’m Gonna Sing” and “Softly & Tenderly” by Hank Williams. Gospel music is perfect for a memorial because it’s so simple—in arrangements and lyrics—that it cuts to a message’s emotional core. It’s reassuring to believers of the sweet hereafter, but also provides something for the nonbeliever. “I’m not religious at all, but these songs give me a lot of comfort. The ideas aren’t necessarily something that I believe in, but I love listening to the musicians, because they are so sincere. It makes you feel all warm and fuzzy,” says Marie Bradshaw (The Folka Dots). The recording process came without premeditation. The ensemble—constantly rotating based on who was available any given Sunday morning—would learn a song and record it the same day. In the Buehner’s basement—Orchard Studios—the musicians would sit in a circle and record the entire album on analog tape (with a machine once used by Levon Helm for Tres Hombres, Buehner states pridefully). “I don’t know if I can ever go back from tape. It sounds so warm and beautiful,” Bradshaw says. “It’s way more expensive, but worth it.” Open Orchard Revival launched a Kickstarter campaign to crowd-fund $10,000 by Dec. 14 for a vinyl run of the album. As of press time, the campaign was still under way and the goal had not been reached. What Are They Doing in Heaven Today? is the sort of album that fills you with hope, yet is touching enough to evoke tears. The music stands on its own. And with that, Buehner feels like he has met Grandma Edith’s wish.